How Much Do You Know About the Ports on WDM Mux/DeMux? WDM (Wavelength Division Multiplexing) Mux/DeMux (Multiplexer/De-Multiplexer) is one of the most important components of WDM systems. You can easily find that there are many ports on the Mux/DeMux with 1RU housing. So, how much do you know about them? And why we need them on the equipment? The connection point of a WDM product where combined channels appear. For a MUX product, combined channels are transmitted from the common port. For a DEMUX, the combined channels are received at the common port. For CWDM products, there will normally be either an upgrade or an express port, but not both. 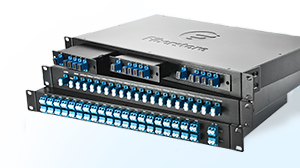 The upgrade or express port on a CWDM Mux or DeMux is used to add, drop, or pass through additional channels which enables the cascading of two CWDM Mux/DeMux modules, doubling the channel capacity on the common fiber link. 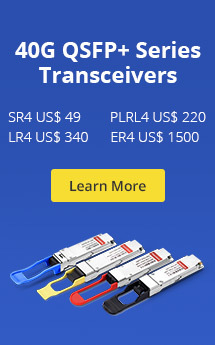 For DWDM products, the purpose of an upgrade port is to be able to add, drop, or pass through C-band DWDM channels not already in use, namely only channels that reside in the band 1530 – 1565 nm. If the DWDM product also has an express port, then that port is normally used for additional channels residing outside the C-band, such as most of the CWDM channels. The 1310nm port is a wide band optic port added to other specific CWDM wavelengths in a module. For example if an 8 channel CWDM is called out it may use wavelengths 1470 nm to 1610 nm and request the 1310nm port. 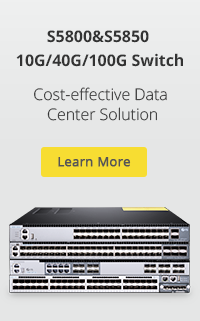 The 1310nm port is used in some legacy networks and sometimes as a return path. If an existing legacy network is using 1310nm port and they have exhausted all fibers and are looking for ways to increase their network capacity they can add in other CWDM wavelengths on to the same fiber while still allowing the use of the 1310nm port. Meanwhile, it can carry LR optics, LX optics etc. Similar to 1310nm port, allows a legacy 1550nm signal to pass and can carry ER optics, ZR optics, LX optics, ZX optics etc. This port is used to monitor or test the power signal coming out of a Muxed CWDM or before it gets demuxed from the signal coming through the fiber network usually at a 5% or less power level. Generally, it can be connected with measurement or monitoring equipment, such as power meters or network analyzers. Network administrators will use this to test of monitor if a signal has failed or changed without having to interrupt the existing network. As is mentioned above, the commonly used ports on WDM Mux/DeMux are with different applications. Each device has common port, but might not has express or upgrade port, 1310nm port, 1550nm port or monitor port. These ports are belong to special service and can be custom to equip with the device according to your requirement. If you have any demand on CWDM or DWDM Mux/DeMux, as well as OADM, I highly recommended you to visit www.fs.com as they can support various of WDM equipment with competitive price and ready stock advantages. This entry was posted in CWDM DWDM MUX OADM, WDM & Optical Access and tagged CWDM Mux Demux, DWDM Mux/Demux. Bookmark the permalink.